Size of Male: 75-110 lbs., 28-30 in. Size of Female: 75-110 lbs., 26-28 in. The gentle and friendly Scottish Deerhound is a very old breed from Scotland. These dogs are closely related to the Irish Wolfhound and were used for similar purposes. Deerhounds are also closely related to Greyhound dogs, although Deerhounds are larger and have a coarse, wiry coat to protect them in the Scottish Highlands. The Deerhound is a sweet dog and eager to please. They have a natural dignity about them and are quiet in the home. They can make very good family dogs but because of their size they may be too big for very small children. The exact origin of the Scottish Deerhound is unclear. Some people theorize that dogs of this type were kept by the Picts and Celts in early Scotland. 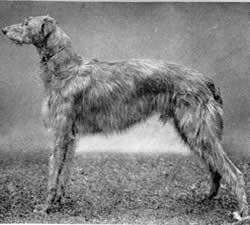 Sighthounds were certainly present in Ireland from an early date and there has always been a close relationship between the Irish Wolfhound, used for hunting wolves, and the Scottish hounds. At different times the Deerhound was known as the Irish Wolf Dog, the Scotch Greyhound, the Rough Greyhound and the Highland Deerhound. The breed was standardized in the 16th and 17th century. They were highly prized as deer hunters and no one below the rank of an earl could own them. This policy nearly led to their extinction in the early 19th century when large estates which kept the Deerhounds for hunting were sold off to sportsmen who broke the land up into smaller parcels and weren’t interested in breeding the dogs. However, fanciers kept the breed alive and restored it. The Scottish Deerhound is a gentle and affectionate dog. They are much more affectionate than most sighthounds. They are loving and friendly dogs and very loyal. They are also dignified and gentle. They are very good with children, but because of their large size you will need to be careful if you have small children since they could be accidentally knocked over. Otherwise, these dogs are great family dogs. They rarely bark. They do not make good watch dogs or guard dogs since they are also friendly toward strangers. Deerhounds are usually friendly with other dogs. However, since they are a hunting dog they have a strong prey drive. This means that they will chase and kill small animals. If you have cats or other small animals in the home, they are not safe. No amount of socialization is going to make this hunting dog safe to be around small pets. Living Environment – The Scottish Deerhound can adapt very easily to living in an apartment. They do require plenty of exercise each day but they are rather quiet indoors and prefer to rest and sleep. They rarely bark, so your neighbors may not even be aware of your dog. They can do well if they have their own yard but it’s best to have a high fence. Sighthounds can usually jump most regular fences if they feel inclined. These dogs do not do well as kennel dogs. They love to be with people. Grooming – Grooming for this dog breed is not difficult. You can use a slicker brush and comb to brush out the harsh coat on a regular basis. This will remove the dead hair and leave the coat in good condition. You should remove the long hair from the ears periodically. Bathe as needed. Diet & Exercise – Dietary needs are considered normal. However, this breed is particularly prone to bloat so it’s best to feed several small meals per day instead of one large meal. They do need to have lots of regular exercise and they welcome having a large yard of their own. You can also take them for long walks. As sighthounds they also enjoy having a run off-leash. However, be aware that you should only allow your Deerhound off-leash in a secure, enclosed area. These dogs are prone to chasing any small animals they see, so if they see something while off-leash they will be off after it. They won’t heed your calls to return to you. Health – The Deerhound has a shorter life expectancy than most breeds. They only live, on average, 8-9 years. Giant breeds often live shorter lives than small and medium breeds of dog. Dog health problems in this breed include cardiomyopathy, osteosarcoma, and bloat. If you are interested in a Deerhound you should talk to a breeder about health issues in the breed. The Scottish Deerhound is an intelligent breed and they have a strong desire to please their owner. This makes dog training much easier than some sighthounds. They can be willful and stubborn at times but, for the most part, training is not too difficult. These dogs are very gentle and can be sensitive so it’s best to use positive dog training methods (praise, reward). If you start training at a young age you should have no trouble teaching your Deerhound.